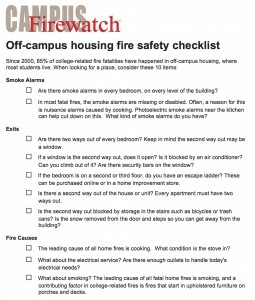 Campus Firewatch has prepared a short checklist that students and parents can use in evaluating an off-campus house or apartment. Is it a full, comprehensive checklist? No…but it focuses on some of the critical issues that can make a difference, such as working smoke alarms, two ways out and ignition sources. There’s a lot more to know, but this covers some of the basics that you should be considering whenever renting a place. Especially since 94% of the fatal fires happen off-campus, according to the U.S Fire Administration and ALL of them have been off-campus since 2005. This is an “at a glance” compilation of fatal campus-related fire deaths that Campus Firewatch has identified since 2000. A series of short videos with students asking important fire safety information. This short film tells the story of the impact of a fatal off-campus fire. Written, filmed and produced by students, it is available for free download. This short documentary is about the impact of a series of nine fires that happened in three weeks across the country at the beginning of the spring 2012 semester and is available for free download. This is a spreadsheet formatted listing of fatal campus-related fire deaths. This is the most complete listing of these incidents available. This is a map of every fatal incident identified by Campus Firewatch going back to 2000. If you would like to embed this map on your web site, use this embed code. This is a more complete compilation of the campus-related fire deaths since 2000 with details on each incident gathered by Campus Firewatch. The Minger Foundation and Campus Firewatch created an RA Guide to Teaching Fire Safety, series of posters, and videos that you can use in helping to teach fire safety to the students on your floors. A very powerful video about the life and death of Peter Talen who died in an off-campus fire at the University of Wisconsin Madison. The Minger Foundation and Campus Firewatch developed a Guide to Teaching Fire Safety to Students with Disabilities and a series of videos to help in teaching fire safety to students with disabilities. There are several organizations that have also focused their efforts on reducing the loss of life and injury on our nation’s campuses. Each year college and university students, on- and off-campus, experience hundreds of fire-related emergencies nationwide. There are several specific causes for fires on college campuses, including cooking, intentionally set fires, and open flame. Overall, most college-related fires are due to a general lack of knowledge about fire safety and prevention. The NFPA has a page focusing on campus fire safety with tips sheets, links to articles and other information available. The Minger Foundation was founded after the death of Michael Minger in a residence hall fire at Murray State University. It has focused on developing educational material and resources for all students, including those with disabilities.